One should really never compare one book with another, even among a single author’s work, but I keep wanting to do it! Part of me wants to exclaim, “I didn’t like this as much as Mrs. Dalloway,” but the longer I sit here and think about it the more I see that it isn’t true. I may have identified with Mrs. Dalloway far more than I did with Mrs. Ramsey, may have been caught up more quickly by Woolf’s words as they poured through me from the pages of another work, but these facts don’t give me the right to say I liked one better than the other. It was made very clear through the conversations across many blogs two weeks ago that reading a book is an experience effected by far more than the content wrapped between two covers. In spite of my eager desire to love To the Lighthouse, things in my own life impacted my reading of it and I found myself struggling to stay engaged. I didn’t particularly like Mrs. Ramsey, and I couldn’t help wondering what all the fuss was about. It’s unfair to say that the book fixated on her, since there is very much more going on than that. I liked how all the other characters seemed to be struggle just as much as I to understand her and their feelings about her, but I set the book aside more than once, wondering “why are we all trying so hard?” That’s why it came as such a shock when, in part two, she quietly exited the book, wrapped in only a pair of parenthesis. Have finished To the Lighthouse, I feel like I’m back at square one, feeling the same way I felt after my first reading of Mrs. Dalloway. I can now recognize my Woolf technique though. My first reading of her books is hard, since my mind, in spite of all my love for the exquisite language, is grasping for plot and story, and running on ahead of me looking for the next event. I scramble haphazard through the book and then suddenly come skidding to the end, mildly befuddled, worried that I didn’t actually comprehend much of what was there. That’s why my second reading of Mrs. Dalloway was conducted so much more slowly, and was such a rich and beautiful experience. I already knew what happened in the book so I needed only (only!) to really dig in and begin to soak it all up. That’s certainly how I will approach To the Lighthouse again – probably sooner rather than later. I can say at this moment that I loved so much about the book – the descriptions of the sea, of the night descending, the whole middle section, Lily Briscoe, and many of Woolf’s thoughts on adult relationships – and I know now that this is only the beginning. I’ll read it again, and so much more will be revealed to me. 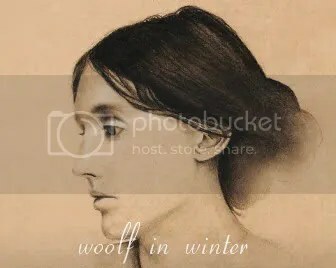 Thanks to this group read – Woolf in Winter – hosted by Emily this time at Evening All Afternoon, I also know that before the weekend is over I will have been stunned by the insights and interpretations of a wide variety of other readers. My own experience of this book will expand and grow. That’s an exciting thought! « The Big Read V: The Woman in White – The Rest of the Installments…! I had to smile when you said you had recognized your Woolf technique. This was my second reading and, unlike the first one, where I must have rushed through breathlessly, as you did with Mrs. Dalloway, this time my book is scribbled all over, passages are circled, post-it notes are everywhere, some of them covered with tiny writing. It’s so helpful to read someone else’s experience of reading a book you’ve just read. Personally, I just can’t make up my mind about Virginia Woolf. I like being IN her books, reading them; but I don’t feel drawn to read them again. Thanks for your post; I liked it very much. I loved your description of your reading experience/technique, Sarah. I related less naturally to To the Lighthouse than I did to Mrs. Dalloway on first readings as well, which is interesting since there’s a central character (Lily) who is more similar to me than anyone in Mrs. Dalloway. But it’s really grown on me as time has…passed. 🙂 Heh. Enjoy your perusal of everyone’s posts! I really liked Lily too, and was grateful she was there to balance out all the things I didn’t care for about Mrs. Ramsey. Such an interesting exchange/differing of ideas between those two! They comforted me so much because I thought I was about the only one who was like, “Hmmm, what’s all the fuss about? Where, for example, is the plot?” Like much of the Japanese literature I’ve come to love, I realize that Woolf is not about plot as much as mood. Slice of life. And that helps me appreciate her more. Did I love either of these books? Not particularly. But, I will read them again, some day, with greater understanding thanks to this read along. I haven’t had a confusing first read with Woolf yet, Sarah, but I can understand the feeling from wrestling with that Augusto Roa Bastos novel you reviewed not too long ago. That book is going to take me months, I’m afraid! 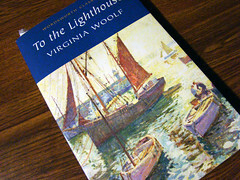 With regard to To the Lighthouse, I too greatly enjoyed the whole middle section and Woolf’s storytelling in general. Who needs a lot of plot when you have such a great bag of tricks being rolled out for you narration-wise? Enjoyed your post! Thanks Richard. I’m eager to encounter more from Woolfs bag of tricks! I guess ‘confused’ is not exactly an accurate description. I pretty much understand everything that went down – I’m just not always as positive that I understand Woolf’s overall intent. I hope you are at least enjoying I the Supreme, given that you’ll be devoting so much time to it! Sarah, the Supreme is great, totally, just requires a lot of attention! And I get what you mean re: intent vs. confusing with Woolf. Only mildly befuddled? I’d say that puts you at the head of the pact from what I have been reading here and there today. You are so right about those first Woolf reads! I always tell people (or students) (but aren’t they people?) to keep reading. Just take a bath in it and most of you will feel all sparkly and shiny at the end. And that bracketed death? Stuns many. Emotional violence in a way. Enjoyed your post here as always! Could we be half way done already? I can’t believe we only have two books to go – I feel like I want to keep on reading Woolf now until I finish! Good thing I have a Persephone edition of Flush: A Biography sitting on my shelf. Seems weird that I hadn’t read anything by her until last summer, and now suddenly I own 5 of her books. This book sounds brilliant, and I half-wish I’d followed Mrs. Dalloway up with it, for Woolf in Winter. I have been reading the reviews though, and I do want to read this. While Mrs. Dalloway is the only Woolf I’ve read, I do agree with you (based on the single experience) – my Woolf experience seems to mirror yours (and a lot of other people, by the look of things). I loved reading your journey through the reading of this one Sarah! I am loving Woolf so much right now – I am actually struggling to decide whether Mrs D or TTL is my fave right now – that might become more complex with the next Woolf read?? I know, right? There’s plenty more Woolf works out there for us to pick a favorite from. I’m really excited about the next two choices – both the idea of a more experimental piece, and one with more structure. Should be really cool. I think you’ll find a re-read of Lighthouse a somewhat different experience. I loved it the first time I read it, but was so much more immersed in it the second time. Woolf is definitely a “multiple read” author. I’m curious to see how I feel about Orlando and The Waves, when I haven’t read either of them before, and don’t know the stories. I’ll be curious to see what you think about The Waves and Orlando too, since I was so surprised by my own reaction toward a new Woolf read. I had forgotten how flabbergast I was when I finished Mrs. D the first time! I’ve never really encountered an author who’s books I wanted to reread almost immediately. So peculiar – and wonderful of course! I’ve remarked elsewhere that I felt as though I dived in, and got pulled under by Woolf’s words. I found myself submerged for long periods of time and would come up for air, feeling stunned and emotionally battered. I like stream of consciousness writing, even if it does require a certain amount of surrender and a willingness to just go along for the ride. For me, reading Woolf is like reading poetry; I need to let my conscious mind go and let the words do their magic. Yes, letting your own conscious mind disappear into the stream-of-conscious of Woolf is so important – and, as I found this time round, not always as easy as I supposed. I love your image of diving in and getting pulled under Woolfs words, since in both this and Mrs. D the water imagery is so strong. Very apt. A few posts have mentioned reading Woolf emotionally rather than symbolically, or with your social critic eye on and I think that’s very apt. The first time through you just have to leap in and give yoruself up to her style and try and grasp anything concrete as the rushing prose takes you past. It’s a lovely way to travel though and of course you can reread as you said. Sarah.. lol. Embarrassing but I had only just now gotten round to all the posts. Anyway, I was comparing all the time, too! Only the other way around (“I loved this so much more than Mrs D..”). It can’t be helped; we’ll always play favourites with so many works of hers to be read, right? I wonder how The Waves will compare. I can say for sure, now, that with every reading, Woolf gets better. I had so much fun with Orlando! I guess as long as we try to see each book individually we can make comparisons! I’ve rarely read so many books by the same author one after another that weren’t part of a series, so this is different for me. I’m really looking forward to hearing your thoughts on Orlando. And I’m really excited about The Waves! I agree that this particular way of going about reading these books can only be called an experience. So much of what I get out of the books comes from reading other people’s interpretations, etc. That doesn’t make my own initial reaction any less valid – half the fun of finishing a book often comes from talking it over with others anyway!